When using Zenstores with WebInterpret there are a few things you need to keep in mind. This symbol means that the Webinterpret hub address has been associated to this international order, when shipping the order will be delivered to Web interprets forwarding hub in the UK. 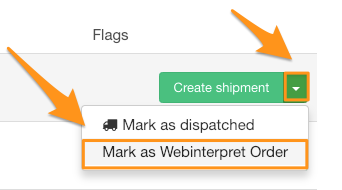 This symbol means that this order can be shipped via Webinterpret's International shipping program but you will need to assign it to be shipped to the Webinterpret Hub address manually (see below for steps). First of all click the little down arrow to the right of the green Create Shipments button. 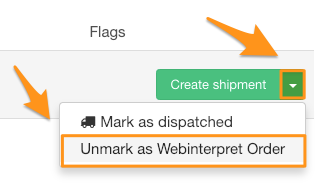 Then click Unmark as Webinterpret Order option from the dropdown. Then the order address will revert back to the original shipping address. This symbol means that we’ve attempted to get a webinterpret hub address but there has been some issue with this order. You can hover over the Webinterpret icon to see the error. The issue could be a number of things but will usually be due to a missing piece of order data like an email address for example.